Edit: For anyone coming across this blog post because you searched “how to use bar soap in the shower,” get yourself one of these Muji sponge soap holders. I’ve had mine for years (recommended by my friend Daren) and I’ll love it forever. As someone who grew up using only liquid soap, I used to think that people who used bar soap were either poor frugal or didn’t care about household maintenance (ie. undergraduate males). Although a fresh bar of Dove soap can look and smell so welcoming, I knew it wouldn’t be long until it was covered in grimy, tepid water. Ew. For Christmas last year, Xixi gave me a big bar of soap from some fancy place in Chicago, and I was determined not to use it until I could do so properly (I didn’t even bring it to New York with me…sorry! Will retrieve it next time!). Soap dishes just get so gross with residue! I’m still waiting for someone to manufacture a bar soap grater. Liquid soap has always been the superior choice to me for that reason. It’s easy to use and you don’t have to worry about it jumping out of your hands or generally looking nasty. My mother keeps a stockpile of Bath & Body Works products in her closet, and it’s a small source of joy when I visit home to wash my hands with those colorful, fragrant soaps containing mysterious blue granules (seriously, what ARE those?). So why bother with bar soap at all? Well, for one, it’s usually cheaper. Plus, anybody with can see that liquid soap requires far more plastic, the production and disposal of which is harmful to the environment. Studies show that people tend to use up liquid soap more quickly, and they contain water and other useless ingredients, which means you’re getting less for your money! People used to worry about risk of transferring germs on bar soap, but that myth has been debunked (see previous link). Besides, bar soap comes from centuries of tradition and craftsmanship, whereas liquid soap is full of chemicals that may or may not be harmful…?!? After moving to New York, I attempted to become a more conscientious consumer and started buying Method instead of Softsoap, because at least they’re biodegradable or something. My roommate seemed to only use foaming liquid soap (while neglecting the purple fossil on the other side of the sink), so I would buy the bigger refill bags from Target. But still, I felt a little guilty about creating plastic waste. When I moved into my new apartment, I was surprised to see no trace of liquid soap in sight. Instead, a few limp shards of bar soap rested on a cute saucer on the sink. I was not impressed. Thus, when those flakes were almost gone, I replaced them with an adorable strawberry cupcake bar soap, which was also a gift (from Adrianna). Its delightful scent permeates the whole bathroom, and I think its spherical shape makes it easier to use than rectangular bars (I can just rub my hands on the “frosting” instead of having to pick it up). Fine. So I was won over in the hand-washing department. But what about bar soap for the body? I normally love buying beauty and skincare products, but I find body wash annoying. Out of all the generic liquid body soaps I’ve used throughout my life (Dove, Olay, etc. ), the only difference appears to be in packaging and fragrance. None of them ever really deliver on their inflated promises (“100x more moisturizing with shea butter blah blah blah!”) and I never even knew if they were making me clean or if I was just paying for useless lather. But using bar soap in the shower is such a hassle. The soap gets dropped at least once per shower, and there’s really no proper place to put it when not in use. Plastic bottles in the shower can get grimy enough, but an exposed bar of soap…shudder. During my visit to Philadelphia a few weeks ago, the hotel I stayed at provided this lovely cucumber-scented bar soap with little exfoliating pieces for use in the shower. It wasn’t moisturizing (I felt squeaky clean afterward), but I liked it enough to nab an extra one from the housekeeping cart on the way out. When I ran out of my heavenly Terraké foaming body wash last week (it’s seriously the best thing ever and I’ll eventually write a review…), I replaced it with the hotel bar soap. My shower puff (pouf?) feels lonely and neglected. Seriously, though, it’s a small but fulfilling change. Plus, now I’m free to try all the colorful, artisan soap blocks I always wanted but could never justify! They’re just so pretty, and probably made with love (/delusional). 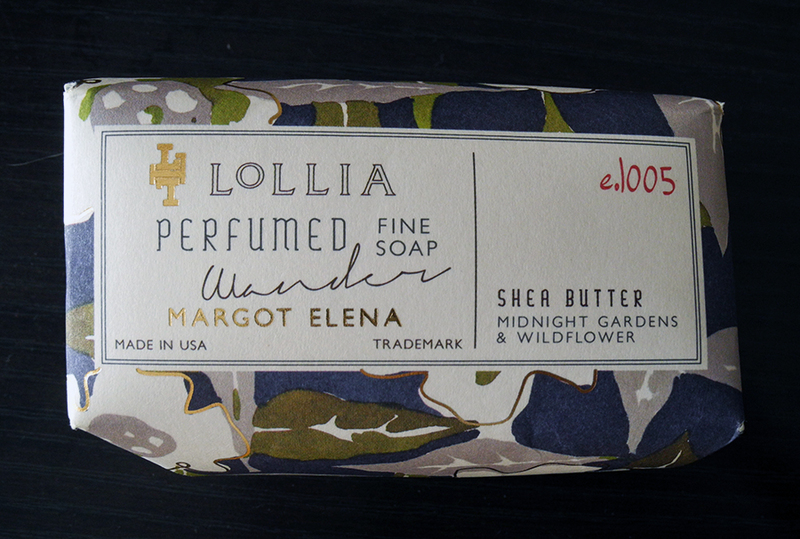 I cannot WAIT to unwrap and use this Lollia bar soap I got from work. IT SMELLS AMAZING. I still use liquid soap for the dishes and laundry, though. Little steps, people. huh…didn’t know you were so knowledgeable on the subject lol I was actually going to go to home depot to check out their soap trays but I’ll swing by muji too! The blue beads are silicate based, basically plastic beads that get washed down the drain. Some exfoliating scrubs have natural ingredients, but most have the plastic beads. You are currently reading I’m A Bar Soap Convert at auradis.